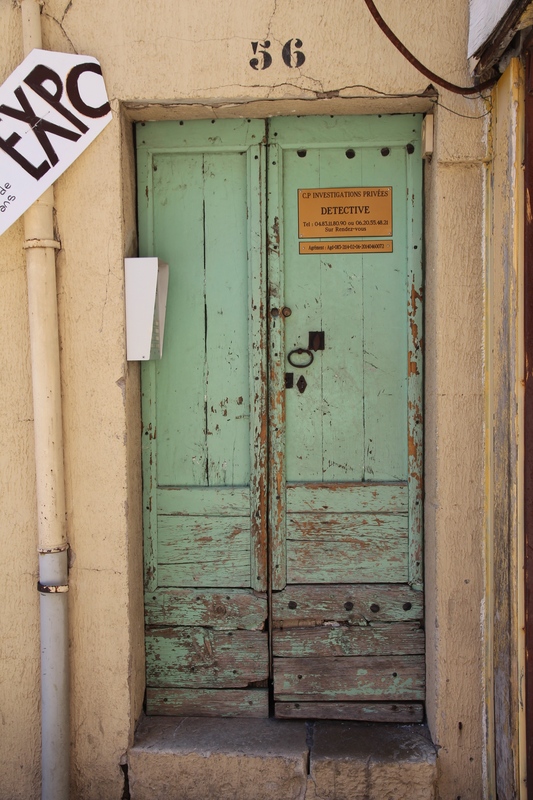 A green door and brass plaque trigger my imagination | Where to next? 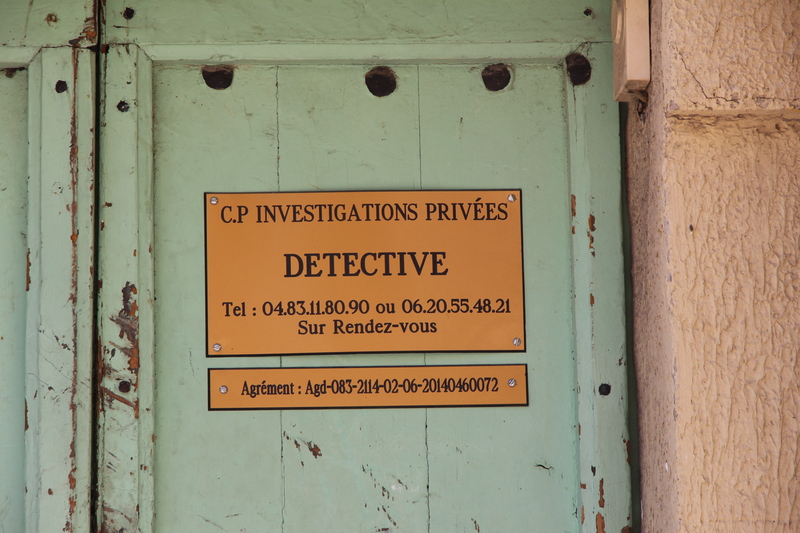 As I stroll through narrow laneways in France, Spain and Belgium, my mind often takes another course—tagging along with the fictional detectives and crime fighters of continental Europe. Suddenly I’m sipping pastis in a small French bar with Georges Simenon’s Maigret. A little later Agatha Christie’s Poirot is pointing accusingly at me as I fumble to hide something in my pocket. Luckily, Inspector Rex of Austria leaps up just in time to push me out of the way of a speeding car. It would have been death, for sure. As an aside, Australia is Inspector Rex’s biggest audience outside Austria. But reality hits and suddenly I am returned to a side street in Draguignan in the south of France. I don’t always daydream, but there’s something about Europe. Maybe it was that green door I saw in Draguignan. Its colour and sign brought back memories of a song from my childhood and tales of mystery. If you don’t know the 1956 song Green Door by Jim Lowe, here’s your chance to hear it. I’ve listened to it thousands of times since my childhood. And if you’ve never seen a brass plaque like the one below, step a little closer and maybe this one will trigger your imagination as it did mine. I love this post. And I’ve just posted about Spain – just for you. Oh, so we’ve got some mental telepathy, detective work going on here? You’re welcome. I know your blog well. Oh yes, him too. But I think of him being in England and not so much on the continent. Did you tell ’em that Joe sent you? I love doors too and have many pictures of them. Now that I know they’re so popular, I’ll do some posts on more doors. Love your play on words. Bobby can go thru the GGD, but Susie can’t. Holly can go thru the GGD, but Stan can’t. Puppies can go thru the GGD, but cats can’t. Poppies can go thru the GGD, but daisies can’t. The folks that knew the game would give many suggestions like this for the newbie to try to figure out why only some can go thru and some can’t. Have you seem a pattern yet? This is just great. That door could spawn a great story. Probably many stories. Maybe I need to go back and make an appointment with the detective. Love the door—love the post!! P.S. I am clueless about the pattern of the verbal puzzle. And it’s driving me nuts. I’ll give you a few days and then reveal the answer, if that’s okay with Midwestern Plant Girl. Or maybe she’d like to give some clues. Love the shot of the green door, Peggy. I must say I’m a sucker for weathered door images and can never get enough of them. I’m a sucker for weathered doors too and have lots of random pictures. Must think of a way to post more. I’m most likely to be able to do one on the doors of Central Asia. I love it! My ‘interesting’ mum worked for a private detective agency which was bought out by the Pinkerton agency. Oh wow, I bet your mum has some interesting stories to tell. Or is she sworn to life-long secrecy? She died about 13 years ago so perhaps she is sleuthing up there? 🙂 She mostly worked for department stores in Europe (internal fraud). After living in the States she had a good American accent that lulled the corrupt workers into a false sense of security. I hope she’s sleuthing up there. And Yank accent! What a perfect cover for her. Yep, Poor John and I love mysteries too.